Sidewalk Trip & Fall Lawyer in LA - No Recovery, No Fee! 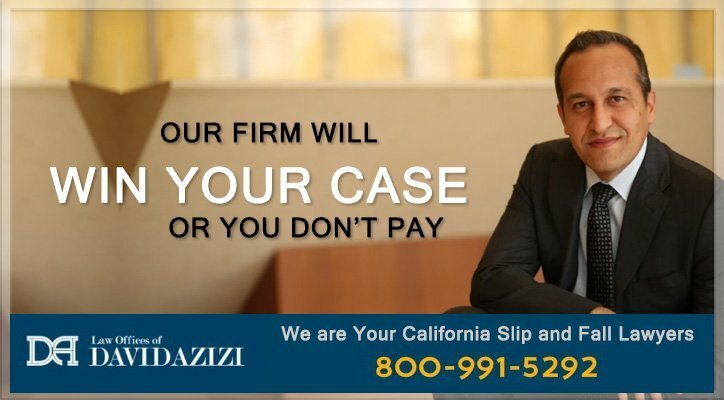 The Law Offices of David Azizi, has extensive experience with trip, slip and fall accidents on sidewalks in the city of Los Angeles that are damaged due to tree roots or disrepair. David speaks of clients he’s helped in the video below. David Azizi has practiced personal injury law for 21 years in California. If you tripped and fell due to negligent sidewalk maintenance or repair by business owners, renters/persons in charge of the property or on government properties, David is available to review your case. During this no-obligation, free evaluation, David will answer your questions and tell you your options as well as what he believes your case is worth. While no one can be certain what the insurance company will pay or a court will allow, David will fight every step of the way to get the maximum compensation to which you are entitled. Call (800) 991-5292 to schedule an appointment at your convenience. On August 26, 2016, a judge in the U.S. District Court for the Central District of California approved a settlement in a lawsuit spanning six years for repair of damaged sidewalks. It has been called the largest settlement in the history of the country. The plaintiffs in the lawsuit, Willits v the City of Los Angeles, included disabled individuals Mark Willits, Judy Griffin and Brent Pilgreen and the nonprofit Communities Actively Living Independent and Free. The case was settled for $1.4 billion. The annual expenditure for repairs is set at $31 million for five years, then increased to $63 million per year after that. The increase after the initial five years covers anticipated inflation. Court costs of $1.7 million and $13.3 million in attorney fees are included in the settlement. The lawsuit began in August 2010 and alleged that disabled residents of Los Angeles were denied public access due to inaccessible and dysfunctional sidewalks, something that had existed for decades. Citing missing curb ramps for long stretches and power poles that impeded persons confined to wheelchairs, the lawsuit claimed that over 200,000 residents with disability issues had to go into the street since the sidewalks were unusable. Plaintiff attorneys argued that lack of access to city sidewalks made them into second-class citizens and endangered their lives. Been Injured Tripping on a Sidewalk in Los Angeles? We know you have questions, call or live chat anytime for help. The city program to repair the sidewalks is known as Safe Sidewalks L.A.* This page has multiple portals where a disabled resident can request sidewalk access for particular locations where damaged sidewalks are inaccessible. There is also a portal where citizens can report damaged sidewalks. Sidewalks next to government buildings on the federal or state level will not be repaired. Once the sidewalks are repaired, the city will turn over responsibility for subsequent maintenance to local property owners. A rebate program and incentives will be given for further sidewalk repair. What Happened to Los Angeles Sidewalks? The problem has existed for decades, worsening over time. Initially, property owners were responsible for sidewalk repair. Along the way, the city acquired funding decades ago to repair sidewalks damaged by city trees. As funds decreased, the city tried to raise money to continue, but residents rejected being taxed for the funds. More recently, in 1998, a plan to raise $769 million in bonds was rejected. In 2014, a plan to increase the sales tax for this purpose was also turned down. Tree roots can grow under sidewalks. As the roots expand, they force the sidewalk to lift and buckle, causing pedestrian accidents. The situation that exists in Los Angeles started a long time ago. When the trees were planted, there might not have been a sidewalk nearby. Alternately, property owners might not have been aware of the tree’s expanding root system. 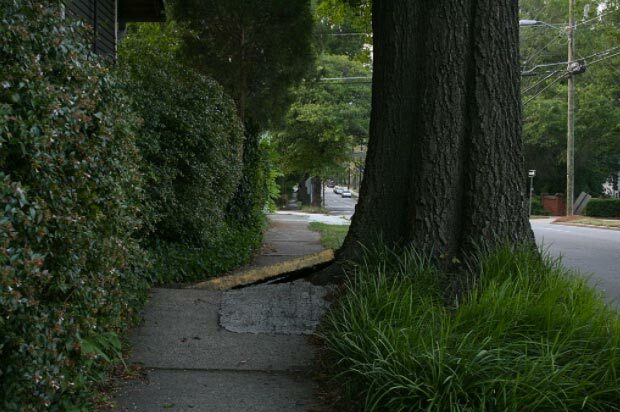 Technically, large trees should not be planted within 20 feet of sidewalks and smaller trees within 10 feet. Proper planning** might have averted the problem Los Angeles faces today. If tree roots expanded and were undermining the sidewalks, proper steps should have been undertaken to avert an even bigger problem. Who Is Responsible for Sidewalk Repair and Maintenance? If you have experienced an uneven sidewalk injury, you need to know who is responsible for maintenance and repair. Checking the Safe Sidewalks L.A. site to see if the sidewalk is slated to be repaired is a good place to start. Finding out who owns the property may require a trip to the Los Angeles property tax office***. They provide office locations you can visit, or fill out an public inquiry online form† to find owner information. Get emergency care, if necessary. Depending on where the accident happened, report it to the person in charge. Generally, sidewalk trip and fall accidents happen in a common public area. Some sidewalks may be on a residential property such as an apartment complex. Others may be within a parking lot owned by a private entity. It is important to find out who is responsible for the sidewalk and file a report. The city has a online portal where you can file a claim for damages. In an apartment complex or business, the manager’s office will help you report the incident. Take a picture of the sidewalk where you fell, including tree roots. Take the picture from different angles if you can. Also, take measurements of the uplift or rise as a result of the tree root. Get witness contact information. The witnesses may have seen the accident happen or be aware of your injuries. In some cases, a witness may have seen other individuals fall on the same spot and may have called the city or person in charge of maintenance to report it. If possible, ask witness to write down what they tell you and sign the paper. Identify any video cameras in the area. Today, they are present on public streets, private businesses or in apartment complex common areas. If possible, take a picture of the camera. Make sure to tell your attorney. Visit your doctor as soon as you can. He or she will document any injuries you have. Make sure to tell the doctor you were in an accident. Medical records serve as documentation linking the injury to the trauma of tripping and falling. Follow your doctor’s instructions. Take pictures of any lacerations, bruises or abrasions when you arrive home. If you are in the hospital, make sure to ask for a copy of your medical records when you leave. The person in control/ lessor or owner of the sidewalk knew or should have known the dangerous condition existed. In the case of city sidewalks, the defense may argue that the number of sidewalks in the city makes it virtually impossible to do that. However, many public employees use sidewalks in different parts of the city every day, such as mailmen or women, meter readers, policemen and traffic officers. Setting up a reporting system would be one way of accomplishing this. In addition, other city residents commonly report broken sidewalks. Following up on these reports is important. The dangerous sidewalk situation was not repaired. Show that, in some cases, the entity in charge or owner knew about the dangerous condition but failed to take any action. Alternately, the owner/party in charge caused the situation to happen. Many clients ask how much is my case worth. This differs from case to case. David Azizi provides a slip, trip and fall calculator to help you begin to answer that question. Lost income: If you are out of work due to your injury, you can be reimbursed for the income you will lose. In some cases, you may be unable to return to the same type of work. In that case, you can recover future lost income as well. Medical Expenses: This encompasses all medical costs such as ambulance transportation, emergency visits, hospital costs, doctor visits, medication and testing such as blood tests or X-rays and CT scans. It also covers office visits with your doctor, nursing care at home and rehabilitation expenses. Other Expenses: This reflects any additional costs you may incur such as gas or taxi fare when visiting your doctor. Pain and Suffering: This includes the psychological, mental and emotional issues you face due to the accident. The cost differs from one individual to another and reflects non-economic or intangible costs. Some common areas involved are anxiety due to the trauma of the accident, fear to engage in the same activity, loss of happiness you obtained from life, damage to relationships, sleeplessness and even post-traumatic stress syndrome. Head injury: Such injuries can range from scalp lacerations to a fractured skull. Fractures can be open or closed. If the fracture is open, the bone is visible through the skin. In a closed fracture it is not. Brain Injury: This includes a subdural hematoma, which is a pooling of blood between two tissue layers surrounding the brain. The pressure it puts on the brain causes symptoms. A bleed into the space where cerebrospinal fluid circulates is called a subarachnoid hemorrhage and can lead to coma and death. Both are caused by head trauma and require immediate medical care. Concussion and sheer injuries to the brain can also occur. Fractures: These can occur anywhere, however, leg and arm fractures are common and may be complex. Hip fractures are serious and may also require surgery, including hip replacement. Knee fractures, particularly when the kneecap is shattered, can cause significant pain and require surgery in many instances. Wrist and Hand Injury: Such injuries include fractures, nerve damage and ligament injuries. All may require surgery. Shoulder Injuries: These include nerve impingement and dislocation. Both are painful and nerve impingement may require surgery and rehabilitation. Spinal Injury: This can occur at any level of the spine from the cervical/neck to the thoracic/mid-back to the lumbar/low back areas. If the vertebrae of the spine are injured, as happens when herniation occurs, surgery such as fusion may be necessary. Sometimes the herniated vertebrae may impinge on the spinal cord itself causing numbness and paralysis. More serious spinal cord injuries can lead to permanent paralysis. Knee Injury: Meniscal injuries are serious in many cases. The medial and lateral menisci are rubbery discs that support knee stability. When the knee is twisted either toward the inside of the leg or the outside, the menisci can be torn. Even with moderate tears, significant pain can result. If the tear is such that torn pieces of the meniscus result in swelling and pain, a partial meniscectomy or removal of the pieces is performed. Facial Trauma: Falling can cause facial trauma. This includes fracture of the facial bones or damaged dentition. The Law Offices of David Azizi fights for client rights. One such right is to be compensated for the damages the victim suffered due to the trauma a negligent action inflicted. When you trip and fall, you are in a maze of filing deadlines, medical bills and lost time from work. Sometimes it seems there is no way out. David’s clients know that is not true. In fact, David wins 98-percent of his cases. He works alongside his clients to obtain a settlement or verdict that is just and meets the client’s needs. David has been recognized by Super lawyers as a top personal injury lawyer in Beverly Hills and Expertise.com as one of the 20 lawyers in Los Angeles. Accolades like these are a fitting tribute to an attorney who puts his clients first and fights for them every step of the way. His clients feel secure knowing they can reach him at anytime on his cell phone, something David offers when he takes their case. Call the Law Offices of David Azizi today to set up a free, no-obligation case review. David will answer your questions and provide options. His legal acumen is highly rated, and his compassion for those who need his help and understanding is well-known in the community. This rare combination is what makes David the trusted go-to law firm in Los Angeles and the surrounding area. Learn what many Angelenos already know, and call us at (800) 991-5292 24/7. * = Safe Sidewalks L.A.